"From Small Beginnings Come Great Things"
We would like to inform you that the school has ended the partnership with All Around Sports and will be creating our own Athletic Schedule posters for the next school year (2019/2020). 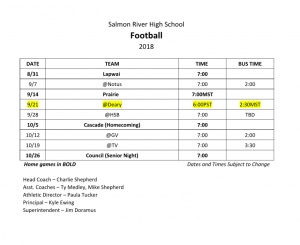 This way, 100% of the proceeds will go to Salmon River High School for extracurricular activities instead of a portion, which has been a wish of community members in the past. 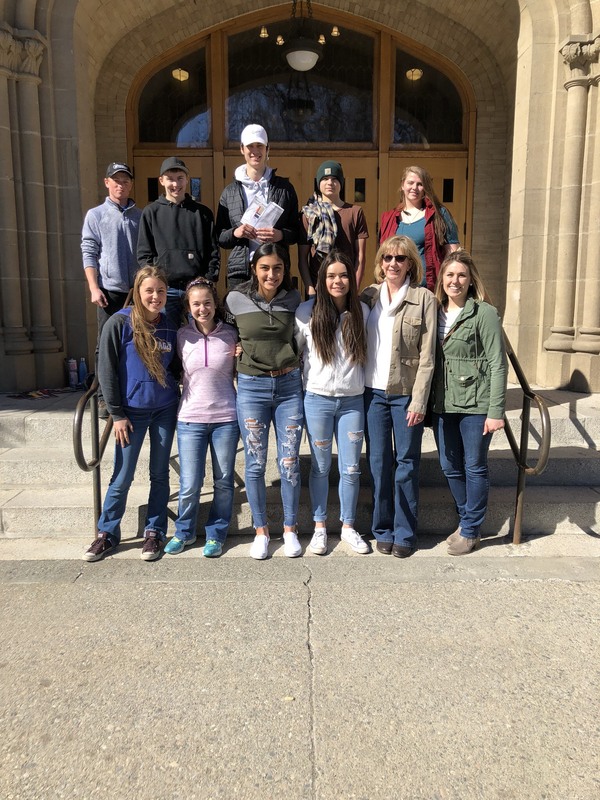 Mr. Ratcliff’s Interactive Media-Graphics class has been working towards attaining industry level Adobe certification as part of a program called Create Idaho. 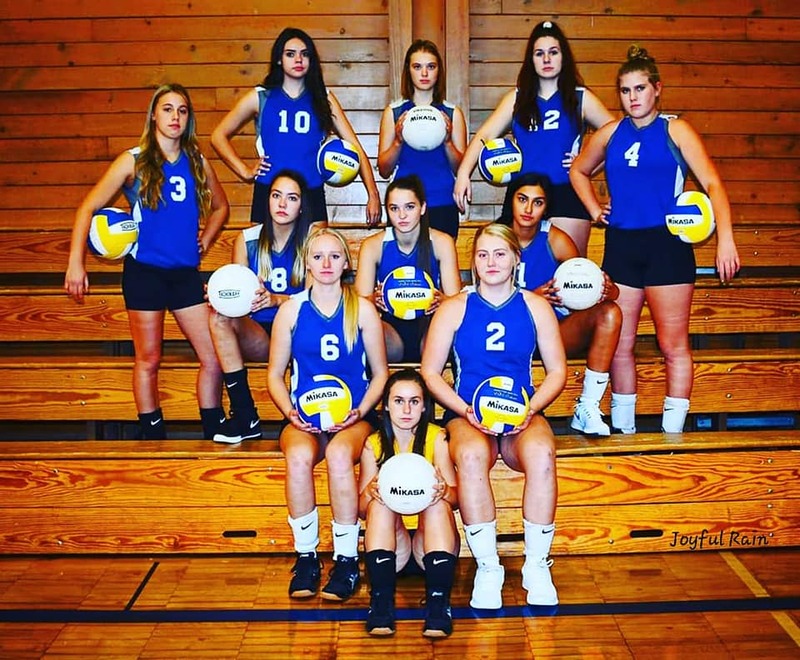 By taking on the athletic poster project, students will gain applicable experience using Adobe programs, such as Photoshop, Illustrator, and InDesign, as well as business skills as they work with businesses to create the ads that will be on the poster. The students are currently working toward being ready to call soon so if you are interested or would like more information about this project, please leave a comment below or email Brandon Ratcliff at ratcliffb@jsd243.org. The 11th grade class attended The Idaho Higher Education Day at the University of Idaho in Moscow on April 20th. The students were able to visit with different state college representatives representing all the state colleges. They walked through the campus and ate lunch in downtown Moscow. News: Local Scholarship Packs are due to Mrs. Best by 5:00 on April 18th. Test is completed by 12:30. Make-up day for all ISAT tests: grades 6th -11th grade. April 22 through April 25th starting in the morning. Schedule will be posted and sent home by Mrs. Kern. In 2010, the Savage Academy opened within the halls of Salmon River High School. At the time, the Academy was one of few digital classrooms throughout the state that was dedicated to offering students online courses during their day. Since that time, many schools have since incorporated IDLA within their regular schedule but Jan Barany was the individual selected to pioneer this to enhance students’ academic options. Jan was a perfect fit! As a lifelong learner and valued member of the school community, she is a mentor to students in ways that personally connect her with students. 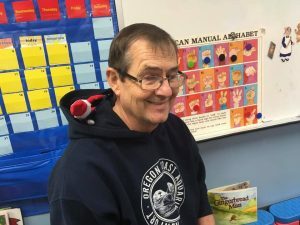 Whether this is working trigonometry proofs on the board with groups of students or following students in their extracurricular activities, Jan has connected with students in a way that provides a holistic support for individuals. 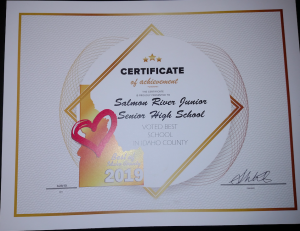 This support, and the active role she plays in students’ academics, is reflected in Salmon River’s overall success in IDLA classes. Since their first enrollment, Jan has assisted students in this 1A school in almost 700 IDLA classes. Of note, her dedication, oversight and assistance provided to students has resulted in a 97% pass rate for all her students enrolled since 2010! As retirement is nearing this year for her, Jan’s dedication to all students will be missed but the efforts she has placed in students will be carried on through their future successes. As retirement is nearing this year for her, Jan’s dedication to all students will be missed but the efforts she has placed in students will be carried on through their future successes. We are having a State Tournament send-off for the boys today at 9:10. Go Savages! Help wanted – Custodian/Maintenance. If interested please contact Michelle Hollon at 208-630-6027. We are also focusing on increasing student attendance including absences and tardies. At the Riggins Elementary monthly “Savage Pride” assembly the “Elf on the Shelf” presented candy canes and a “Savage Pride” pencil to all of the students who met the school’s attendance goal for the month. I would also, like to thank the PTO for providing lunch for each of the Student of the Month recipients. Congratulations to Mrs. Medley’s 2nd grade! They have 96.557% attendance for the year! We want children to succeed! So, our goal this year is to increase attendance to 90%. We are almost half way through the school year and on our way to achieving that goal! The elementary average is currently at 94.993%. The high school/middle school is at 91.056%. 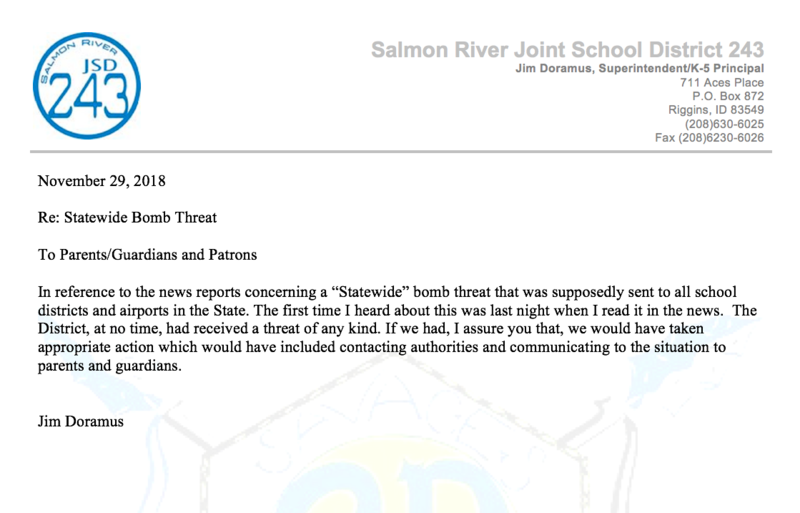 In reference to the news reports concerning a “Statewide” bomb threat that was supposedly sent to all school districts and airports in the State. The first time I heard about this was last night when I read it in the news. 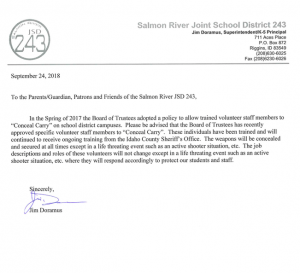 The District, at no time, had received a threat of any kind. 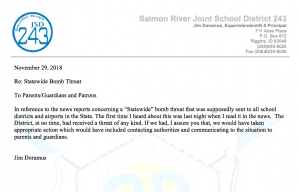 If we had, I assure you that, we would have taken appropriate action which would have included contacting authorities and communicating to the situation to parents and guardians. 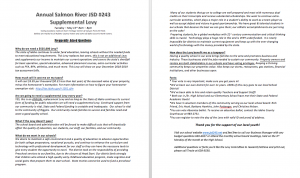 Salmon River Jr/Sr High School will host an ACT School Day Test on Feb. 20th. Cost: Special test price determined by ACT $42.50 -with out the writing test; $57.00 with writing test. Students must sign up by 12/ 5th with Mrs. Best. 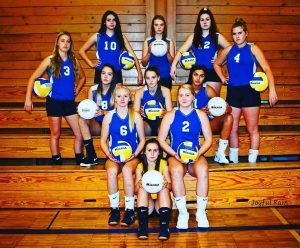 SRHS volleyball team is the IADII fall sports Academic State Champions! This is the highest team volleyball GPA in the state! Great job girls and Coach Tucker! A big THANK YOU to Payette American Legion Auxiallary,Jacki Valentine, Kilgore Motors, LDS Church, Midas Gold, and the Riggins Whitewater Market for the awesome school donations. Welcome back to school! The first day is August 28. See you there! Please be prepared to pay fees at time of registration. If you are registering a returning student, a parent or legal guardian is required at registration. All the registration paperwork will be posted on the website in advance (next week). Please print, fill in, and bring to registration to help speed up the process. Football season is on it’s way! 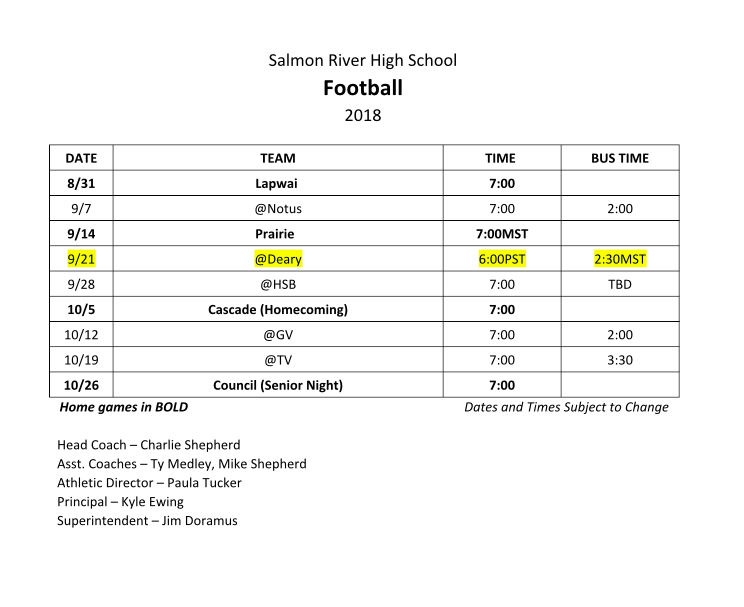 Here is an updated schedule. On behalf of the Board of Trustees, our staff, our students and myself, THANK YOU for your continual support. 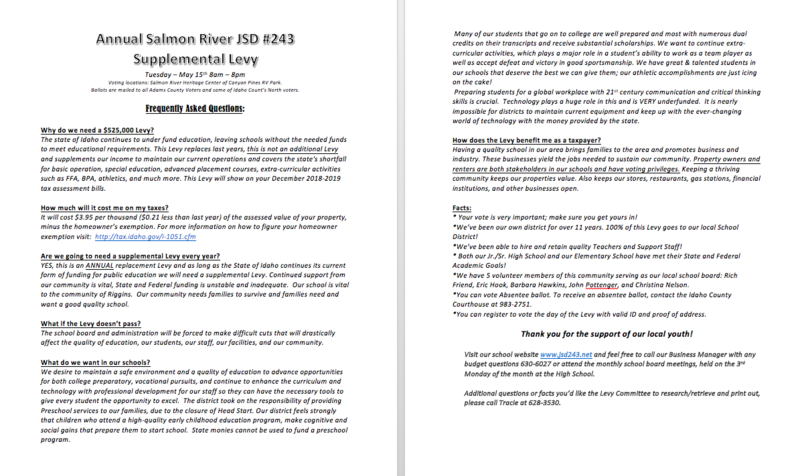 The annual Salmon River JSD 243 supplemental levy vote will be Tuesday, May 15 from 8am to 8pm at the Salmon River Heritage Center and Canyon Pines RV Park. 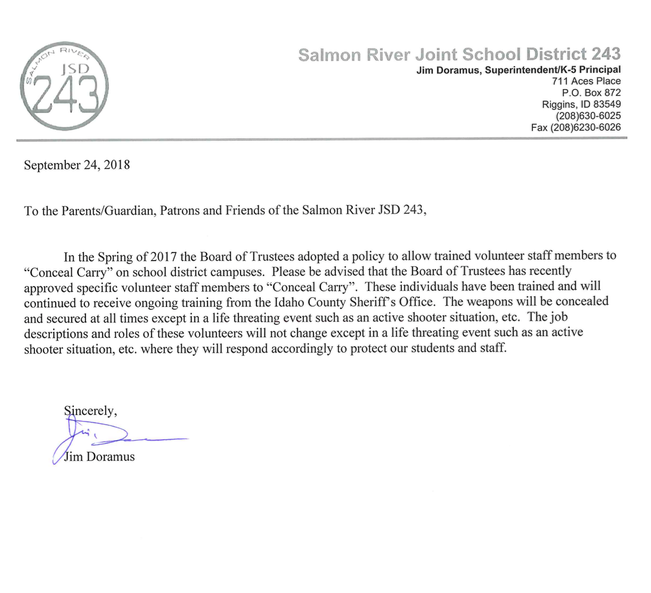 See the letter below for more information. We need volunteers…we need YOU! Volunteering at the RES Book Fair is the perfect way to stay connected to your child at school and help students find the books they can’t wait to read. Sign up now and get ready for a fun and rewarding volunteer experience. We will need volunteers to work the Spring FlingMay 10th and then also at the Elementary on the 14th to the 17th of May. Below is the link to sign up sheet to volunteer for the book fair. 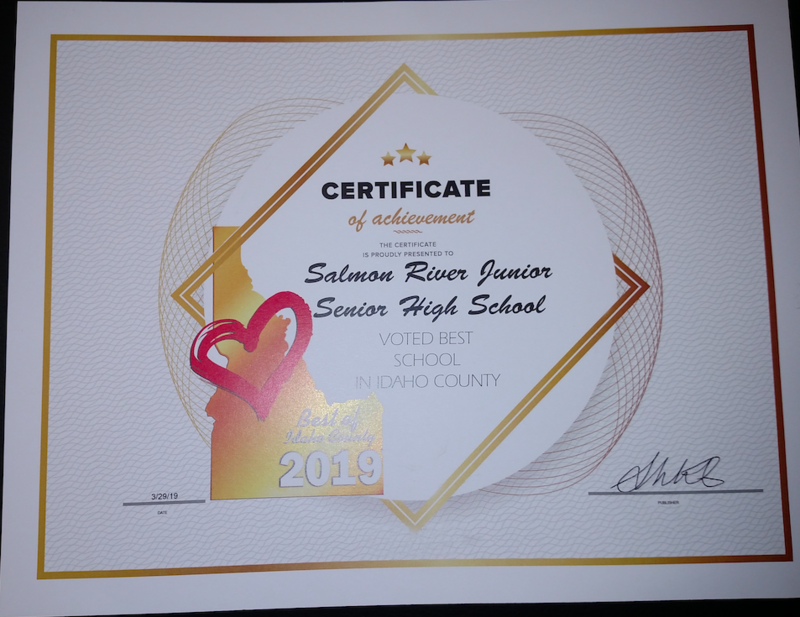 Salmon River Jr/Sr High School was nominated and selected as the Best School in Idaho County! Thank you to all who voted. School has been cancelled for Monday, January 11, 2019. Copyright © 2019 JSD #243. Built on WordPress and Wovax.